At Campsite La Faz in Écrille (Jura) camping costs as little as €16,- per night during low season with CampingCard ACSI. At one of the 99 touring pitches you will get a discounted rate during the period 27-04-2019 - 30-06-2019 and 25-08-2019 - 30-09-2019. At this campsite you can not only use your CampingCard ACSI for inexpensive camping, you can also use your ACSI Club ID (as an alternative ID). 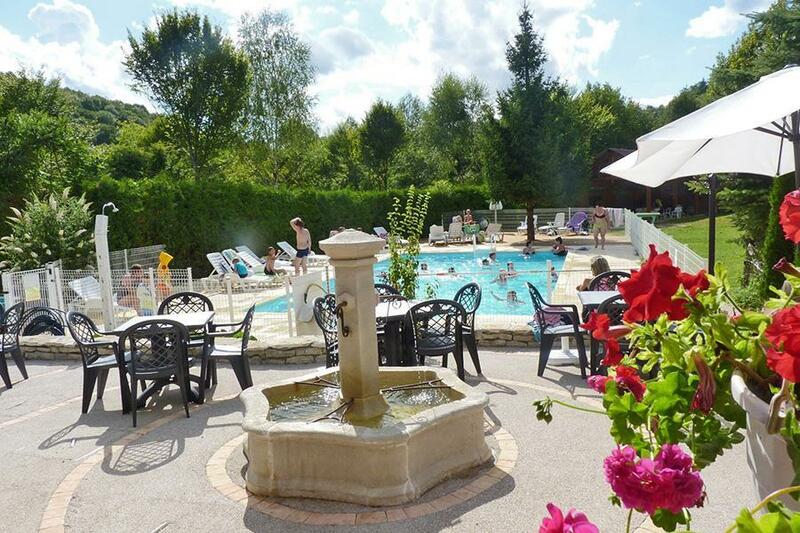 A campsite located in extensive grounds by a river and a stone's throw from Lake Vouglans. The area is perfect for peace, relaxation and nature walks. Pitches marked out by hedges. There is a snack bar and a swimming pool. No toilet facilities in April and October. What a gem - BUT - depending where you are on the site you could be an awfully long way from the toilet emptying point and when you get there you have to lift your toilet a LONG WAY UP and any splashes are near your face! Other than that, this is a lovely site. Beware when first arriving - do follow the instructions carefully as the obvious route from Lons le Saunier to Orgelet is prohibited to caravans just outside the town of Lons le S.
We received a very friendly welcome from the owners but as they spoke no English it was a good opportunity to practice my French. The words I couldn't understand were more than adequately translated using the international language of waving your arms!! The pitch sizes were very generous and very well screened. If you want bread, order it in advance at the office. Lovely hot showers in unisex blocks. Small but lovely pool, very clean and well maintained. Overall, a really relaxing site. We never left the site in the motorhome so can't comment on nearby attractions. We never tried the bar or food either, available every evening. Only downside is the water tap - it's on one side of the site and in a camper van, it meant having to drive over to top up daily. Go here for the peace, quiet and great value. Would you like to book Campsite La Faz or request more information? You can do both using the information below or by visiting the campsite's website. From Lons-le-Saunier D52 direction Orgelet via the D678 and then D52e and D52 as far as Orgelet. Take the D470 and turn immediately right to Ecrille. Follow campsite signs. CampingCard ACSI will send your information request to "Campsite La Faz".